Entrance Fee: For the adults, the price of entering the palace is Rs 40 while for students it is Rs 20. And it is free for kids below 10 years of age. Besides this, the foreigners have to pay a sum of Rs 200 as entrance fee. You pay an additional Rs30 for photography inside and Rs100 for videography. Visiting Time: Hop down to fall in awe of this palace from 6am to 9am in the morning and from 3:30pm 6:30pm in the evening. The palace gates are closed on Sundays and other government holidays for the tourists. Visiting Duration: It may last anywhere between 1 hour to 3 hours as it entirely depends on personal taste and keenness about historic relevance. Battery operated vehicles have been introduced by the government so that movement of the tourists across the palatial palace can be made easier. Do not forget to avail these if traveling with elders or little kids. There have been scams done by the local police in extorting bribes from the wary tourists. Beware of that when here. Footwear is made to be removed before entering the Palace interiors. There are shoe racks available, but kindly be cautious in case of very expensive shoes. Pay a visit during the time of Dusshera to witness the most astounding site of the Palace illuminated with what seems like a million light bulbs. There might be local scammers waiting to loot or dupe the umpteen foreign visitors flocking here. Take care of your guests and keep an eye out for such dupers. The security is tight here and do not try to tamper with the proceedings for your best visit. Admire and appreciate the astounding Indian heritage and every little detail about the lifestyle and aesthetics of the royal life. 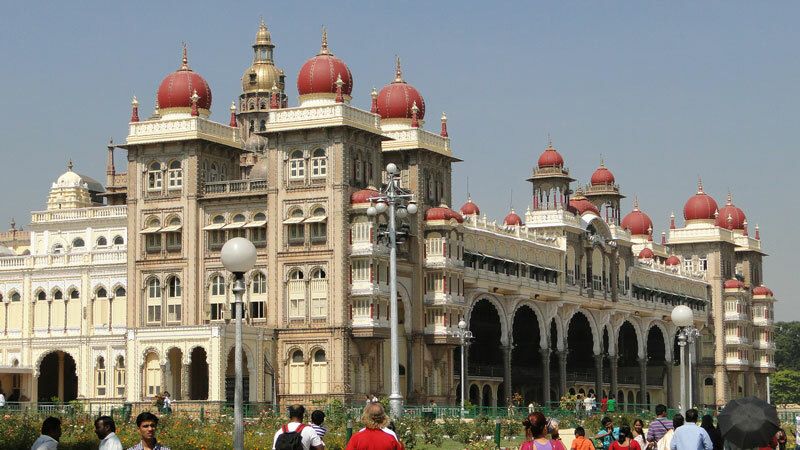 The Mysore Palace, is a whole experience in store for the history enthusiasts and people interested in keeping a keen knowledge about the Wodeyar rule here. There humongous palace also has 12 renowned temples divine to the Hindus. You can pay your obeisance here. Learn about the tunnels, secret passages and ways through which the palace successfully protected its lineage throughout the years. Sound and light shows elucidating historic and cultural details are conducted at 7pm throughout the week except Sundays. There are guides available here who have a remarkable hold about the knowledge and legends and all the nitty gritty details about the palace. They’ll also help you reach and explore closer inside the palace. The months between October to March are the most pleasant and offer a comfortable stay here. Avoid summers as they are very sultry hot. The nearest airport is the Bangalore airport only 170kms away. You can catch a train or book a cab to reach Mysore from there in about 3 hours. KSRTC buses also plya at regular intervals to make your journey convenient and possible. It is well connected to other major cities through roadways. It is the ceremonious accommodation and nerve-centre of the Wodeyars who reigned the Mysore city from 1399-1950. 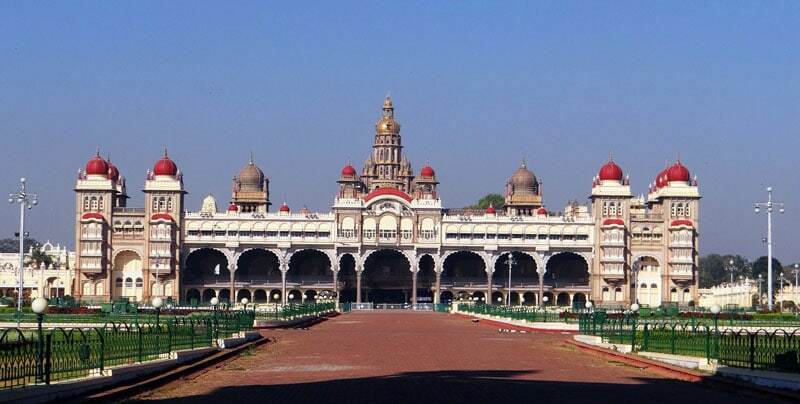 The location of the palace is in the centre of inner Mysore. To its east, lies the Chamundi Hills. No wonder the Wodeyars were fervent devotees of this Devi. The palace exhibits the Indo-Saracenic style of architecture. Tinges of Neo Classical and Gothic-Revival styles can also be seen. Yadureya Wodeyar built the prior establishment in the 14th century and since then it has been revamped a few times. The present structure was then built under Krishnaraja Wodeyar IV. The kosher wooden establishment got savagely burnt in 1897, while the wedding of Princess Jayalakshmi Ammani was underway. The peacock emblems orchestrated in geometrical patterns on the multi tinctured ceiling has been contrived in Glasgow, Scotland. The most interesting thing is that the cellar of the palace has many secret tunnels that lead to several privy areas and other towns e.g. the Srirangapatna. These tunnels ensured the safety of the king during times of enemy trouble. Gajalakshmi– the Indian Goddess of fortune and luxury rests on the summit of the central arch inside along with her elephant structures. The palatial palace with 2 durbar halls, colossal array of courtyards, lush gardens and buildings is now converted into a museum which is maintained by the Department of Archaeology and Museums. This opulent abode of the rich Wodeyars is also called as the Amba Villas. During the Mysore Dasara festival celebrated in autumn every year, the palace is lit beautifully with a million light bulbs lit since the dusk. You cannot afford to miss India’s one of the biggest and opulent palaces waiting to teach you so much about our rich heritage and the grandeur lifestyle of the Wodeyars.